Medina Sunrise Rotary Club held its annual Change of Gavel Ceremony, honoring outgoing president Roger Hassler (2016 - 2018) and incoming president Dr. Shail Jain, at Medina County Park District's Carolyn Ludwig Mugrage Park, located on Windfall Road. "Mugrage Park was established when Richard and Beverly Mugrage generously entered into an agreement to donate their 100 acre property to the park district," stated Nate Eppink, Director of the Medina County Parks District. The park includes two parking lots, a one-mile paved multi-purpose trail, a one-mile gravel trail, a three-acre fishing pond, an accessible fishing pier, a picnic shelter, picnic tables, a dog park, and an inclusive playground. The inclusive playground is for children of all abilities to safely access and enjoy. There are double-sized ramps for wheelchair users and a poured-in-place rubber safety surface that protects children from falls and also provides easy wheelchair access throughout the playground. 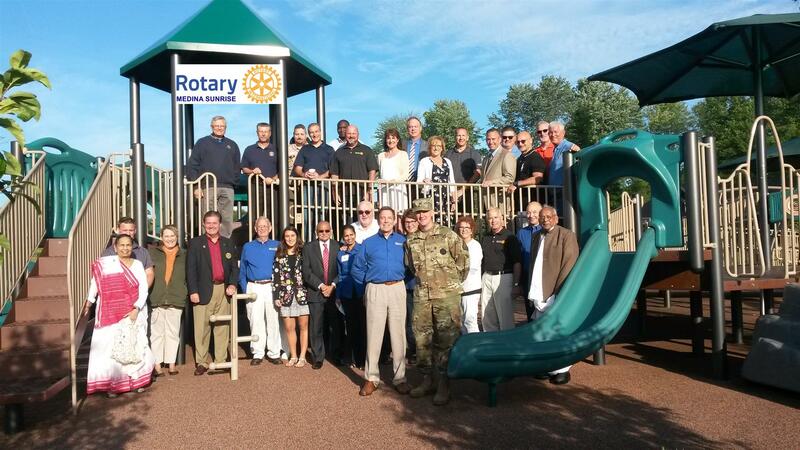 We are grateful to the Friends of Medina County Parks, Inc., Medina Sunrise Rotary, as well as many individuals and organizations which raised over $250,000 to fund this playground. Roger Hassler, outgoing Medina Sunrise Rotary Club president (2016-18), welcomed our many special guests, including: Assistant Rotary District Governor Kevin Wermer, Wadsworth Rotary president Tim Manion, President-Elect James Collins from Brunswick Rotary, prospective Rotarian Paul Knizner, Honorary Rotarians Mark Morse and Linda Glass, Sergeant Kevin Clark from the Medina Army National Guard Armory, Rotary Youth Exchange Student Elizabeth Whetstone from Buckeye High School, Executive Director Allan Kizito from Sanyuka Children Ministries in Uganda, Deb Poland from Medina Creative Housing, Parks Director Nate Eppink, Dr. Shail Jain's mother Mrs. Sushila Mohanka - an Honorary member from Patna Rotary Club in India, and Shail's uncle Mr. Govind Dalmia - a founder of the Deoghar Rotary Club in India, District 3250. Roger thanked everyone in Rotary for their unflagging support and recognized his Board of Directors and officers with personalized awards for their service to the club. This year's prestigious Service Above Self McClintock Award went to Dr. Reid Miller along with a 43 Years of Perfect Attendance pin. The President's Ray Award went to Richard Pace who spearheaded the club's finances and "Wine & Rises", the annual fundraiser. Incoming president Dr. Shail Jain presented Roger with a jeweled past presidents pin, a classic president's gavel plaque, and a Rotary necktie in appreciation for his leadership and friendship. Thanking the many Rotarians and guests, Shail concluded her first official meeting as Medina Sunrise Rotary Club president with the Rotary 4-Way Test of the Things "We Think, Say and Do."